Keep Your Patients Safe and Comfortable for Maximum Throughput! Includes pack of two pads to accomodate each side of the patient. Pads are 19.5" long x 14" wide x .625 deep. The first dedicated advanced patient pads specifically designed to protect patients from thermal injuries during MRI. Don’t scan another patient without MRI Patient Protection Pads! • Permanent antimicrobial agent to inhibit the growth of 99.9% of harmful bacteria. • Decreased patient motion during scans due to enhanced patient comfort. 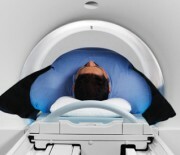 • The ultimate in pressure management technology for MRI, CT, and PET scanners. • Reduces peak pressure, friction and pressure for improved blood flow. • Can be easily cleaned and disinfected with any standard hospital disinfectant. • User friendly - Reduces operation costs. • Quick return on investment after purchase. • Ultra-strong fabric with seams sewn with coated nylon thread to protect viscoelastic core material from body fluids. • Vapor, moisture impervious and latex free. • Reduces sweating and shearing. Flammability compliant to CTB-133 standards, the required standards for most states.